Need Droitwich Removals and Storage? If you are looking for a family run Removal Company to take care of your precious belongings, look no further than Britannia Bennetts, moving customers across Worcestershire and the Three Counties. Started over 30 years ago by Alan Bennett, we can pack and move your belongings locally, nationally and also ship them to any destination worldwide, giving you peace of mind that your home effects will be in safe hands every step of the way. 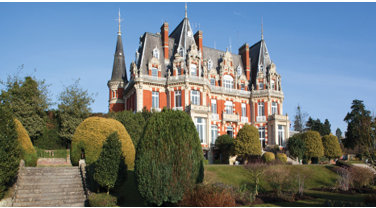 The Chateau Impney dates back to 1875 and is one of the finest examples of French chateau-styled buildings in the UK. It is originally the family home of John and Anna Corbett, it is now used for conferences, exhibitions, weddings and functions and is easily recognisable from the A38. We have all types of Droitwich Storage options in place, whether you require Container Storage; Self-Storage; Internal Storage; External Storage; Holdover Temporary Storage (14 days or less), our team will be pleased to help you find the best solution to suit your storage needs. No time to pack? Maybe our packing service is the answer - whether you need our full packing service or, a fragile pack, we can tailor our services to meet your needs. As part of this service, we use our specialist materials to undertake packing that perhaps you don’t have time to do, or which you physically can’t manage, or you would like it done professionally - we will do it carefully and quickly. Ask us for a packing services quote, you might be surprised at the low cost of this service, one less thing to worry about before your move. Use our helpful Removal Guide to ensure the many things to do when moving house remain organised and within your timescale. During the countdown to your big day, we’ll make it easier for you, ensuring no important details are forgotten. Whether you require commercial or house removals Droitwich, we can help.